Scandic Hotels success story - FUTURE-PROOFInc. Below you find an interesting article about Scandic hotels and their sustainability journey. What the author described so well is the real value and effectiveness of our integrated TNS approach (a.k.a. FSSD) for sustainable innovation. The enthusiasm and results are comparable with what we hear from and about o.a. Nike, IKEA, Interface, MaxHamburger, Whistler, Eindhoven, etc. where our approach has played a similar role. These organisations are seen as organisations that have sustainability in their DNA. It is true as their sustainability principles are based on the workings and limits of nature: ‘FSSD Inside’. Applying these helps to deal with causes of global problems instead of the resulting problems. We are available for further elaboration on our capacity building, innovation or transition programs to help you apply the principles to create similar success stories in your organization, irrespective of your sector. Nowadays “greenwashing” is a popular term. We are aware of companies such as BP Oil and many others being accused of greenwashing, claiming eco-consciousness or launching products and services that are less than legitimately green. But few people know that the term was originally coined to criticize hotels that encouraged guests to reuse towels for environmental reasons but made little or no effort to recycle waste: “Dear Guest…Save the planet! Keep your towels…” Meanwhile, the unaware housekeeping department was flushing the toilet four times or leaving the faucet running while cleaning a room. Jay Westerveld, an environmentalist who accused hotels of these practices, coined the term in 1986. Believe it or not, nearly 30 years later, most hotels around the world are still doing the same thing: urging guests to save the planet by reusing their towels while applying unsustainable practices in their operations. No wonder why consumers are the first to be skeptical about hotels claiming sustainability practices. This is because, as John Grant stated in his book, The Green Manifesto, green marketing is a principle, not a proposition. It’s not what you say you believe in, it is what you show that you do that counts. Sustainability is transforming the way companies operate. The current trend is to integrate sustainability into all company activities. “Formerly, sustainability was a department, one that gathered information, reported internally and externally and thus policed those activities of the company. Now, sustainability is thought of as a mindset and a set of tough principles, which everyone in the company should use in its daily work”. Scandic’s goal is to be one of the most environmentally sustainable hotel chains and they are definitely accomplishing this. The good news is that there are such models – incredible companies like Scandic. These sustainable companies are at the forefront of environmental and social practices. They have organized themselves in such a way that every manager and rank-and-file employee is empowered to be innovative in sustainable practices. These companies have embraced sustainability to a point where it becomes part of the company culture; and it actually pays off. Innovation happens as a continuum within day-to-day working practices, improving the bottom line by reducing energy and water consumption or waste, or by designing new products and services that have less environmental impact. Sustainability, in this context, is viewed as a never-ending path that requires continuous improvements and new goals. Jacquelyn A. Ottoman in The New Rules of Green Marketing reminds us that the new rules call for businesses to excel by being proactive, aiming to surpass minimum compliance standards. Indeed, they set the standards by which they and their competitors will be judged. So, if today we have decreased our carbon footprint by 65%, our goal for the following years will be to become carbon neutral by purchasing and producing 100% of electricity from producers who only use renewable fuels. Such sustainable companies are not satisfied with simply reducing waste -maybe from 2kg to 0.7kg per guest per night; they strive to divert all waste from going to landfill. Regarding social aspects, no matter how much they have contributed to social activities -for example 2,000 hours of community volunteer work- they are willing to increase their contribution even more in subsequent years. Sustainable companies such as Scandic Hotels know that true ecological sustainability is not a cost to the company. To the contrary, it is a source of profits and a real competitive advantage. The holistic perspective of the theoretical framework for sustainability provides a triple bottom line: (1) the environmental dimension: how can we minimize environmental impacts in our organization? (2) The economic dimension: how can we maximize our economic profit? And (3) the social dimension: how can we maximize the social well-being of all stakeholders? As Dr. Brian Nasstrass says: “there are two indicators you’ll know that a company is taking seriously about sustainability. Number one, sustainability is built into the strategic planning of the organization. Until it is in the strategic plan, they are still playing around with it and are not serious about it. And secondly, when promotions or remuneration of the organization’s senior executives are based on their performance on sustainability goals”. These truly sustainable organizations believe that sustainability is neither a fuzzy word nor a patch to apply in order to comply with environmental regulation or with the corporate social responsibility report. They go beyond what is expected from regulators and other stakeholders. Hotel chains such as Scandic not only inspire their employees, but also their guests and the rest of their stakeholders. A truly sustainable pathway never ends; it requires continuous innovation. Hotel chains such as Scandic enhance organizational knowledge by making every process of its operation more efficient. This is not only executives and managers thinking about how they can cut costs in order to increase the bottom line, but also the majority of employees participating with actions and ideas toward sustainable practices. Scandic analyzes the whole life-cycle approach of the hotel, from its very beginning, in the design and construction phase, through its operations and refurnishing, until its end. They analyze upstream processes: how waste and environmental impacts can be reduced through the value chain. It involves choosing the right suppliers and co-innovating with them. Real sustainable companies are also socially responsible and committed to social programs. They are involved in a continuous and sincere dialogue with their customers and employees. Are customers rewarding sustainability practices in hotels? Although many customers demand sustainability, hotel operators are concerned about whether sustainability increases or decreases hotel bookings, costs and profitability. Mainstream hoteliers perceive sustainability as large investments and additional costs not worth taking on. There is a problem of unawareness and lack of education. Working to achieve sustainability requires a new mindset. It requires knowledge. Notwithstanding, Scandic has shown us that sustainability actually pays off. It saves businesses money in the short, medium and long-term, but also increases brand awareness and positioning –credibility-. Yet this could only be possible if you’re a truly sustainable company and not the greenwash we’re used to seeing- hotel chains that halt their green efforts after the first year. Or one of those hotels that abandon their environmental efforts right after obtaining their EMAS certification (Environmental management decision- making in certified hotels by M.J.Bonilla-Priego, J.Najera, X.Font,). Nevertheless, these hotels still claim to be green. Are then customers expecting hotels to be committed to environmental and social practices? The latest research from Cornell University (Hotel Sustainability: Financial Analysis Shines a Cautious Green Light. By Howard G. Chong and Rohit Verma) may reinforce those skeptical opinions against environmental strategies. The study concludes that earning a green certification does not automatically result in a large revenue bump nor a revenue fall. In short, green is not a “silver bullet” strategy. In spite of the “Green Gap” -consumers are not willing to pay premium though they ask for green products- real sustainable hotel chains, like the one I am presenting in this case study, can indeed gain a competitive advantage. Truly sustainable companies are able to share values with customers, and thus increase their loyalty. They can approach a competitive advantage by gaining credibility and creating more demand for their products. Sustainability is defined as the development that meets the needs of the present without compromising the ability of future generations to meet their own needs. But how do we know if we are compromising future generations? 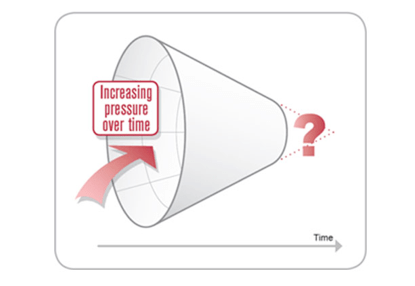 The metaphor of the funnel simply tells us that, as time passes, there is increasing pressure on companies due to resource constraints, as a consequence of increases in per capita consumption and population. The current world population is now 7 billion people and expected to be 10 billion in this century. So the challenge for sustainability and the change for individual organizations is how to navigate into the future; how can companies be successful in their markets without hitting the walls of the funnel? Scandic Hotels was one of the first hotel chains to believe that it is a good strategy to do the right thing for the environment, and earn money at the same time by sharing values with its guests. They linked customers and employees with a shared vision about the environment and social issues. Scandic Hotels are not only customer and employee focused but they unify core values for both of them as well. As former CEO Ronald Nilsson prognosticated: “Tomorrow’s market is about mutual values. Scandic had been looking inward –as many hotels today do; only focusing on the product and services- instead of outward at the values of the market. The next generation won’t tolerate insensitivity with the environment”. How did this great strategic story of sustainability begin? In 1992 Scandic Hotels was about to declare bankruptcy. Between 1990 and 1992 the hotel chain reported losses of approximately US $50 million. A new CEO, Ronald Nilsson, was hired to make a tremendous turnaround. Contrary to common wisdom, which said that any environmental program could only be carried out if the company was first financially healthy, Nilsson made environmental responsibility one of the core values from the very beginning of the turnaround. At the same time he decentralized the company, giving more power of decision to managers and front-line employees. If Scandic was to be truly customer focused, employees needed to be empowered to make the right decisions and act accordingly. Such a strategy required a great psychological and cultural change, not possible to accomplish if it weren’t for Nilsson’s leadership. Nilsson knew about the Natural Step and its success in implementing sustainable principles at IKEA. Scandic was going to be transformed into the “IKEA of hotels,” and the overall guiding spirit was to communicate the new shared values with the customers. The Natural Step, a Swedish non-profit organization, was primarily chosen because it was not the traditional environmentalist NGO telling you what to do. Instead, they gave Scandic –just as they did with IKEA- the scientific principles of sustainability with which to start building a share metal model within the organization. Once the Natural Step framework and methodology was taught to the whole company –all 5,000 of its employees at the time- in a period of 6 months they were on their way toward sustainable practices. Only in the first two years they implemented 1,500 actions, reducing costs straightaway in energy and water and waste disposal, as well as improving best practices and eliminating harmful chemicals –cleaning products. Leading The Natural Step was Dr. Karl-Henrik Ròbert. Dr. Ròbert was a cancer researcher who became enthralled with the mission of developing sustainability principles at their roots. Together with a group of scientists, he created the four system conditions of sustainability. The Natural Step methodology was the perfect framework for supporting businesses. In a sustainable society, nature is not subject to systematically increasing concentrations of substances produced by society. According to the second law of thermodynamics, energy becomes more dissipated and less useful. This is referred to as the entropy of a system. Just as with System Condition 1, System Condition 2 puts special emphasis on substances that are unusual in nature such as dioxins, herbicides, pesticides or CFCs and many other chemicals harmful for the environment produced by society. In a sustainable society, nature is not subject to systematically increasing degradation by physical means. Agriculture and forestry are not practiced in ways that lead to a loss of nutrients, extinction of species, or sinking sub-soil water levels. Sustainable options are to buy food from farms that grow crops sustainably and obtain materials from environmentally managed forestry plantations. In a sustainable society human needs are met worldwide. This system condition recognizes people’s constant striving to improve the ways in which we satisfy both our needs and those of other people. For companies, this is largely a matter of getting better at giving customers what they want, while using fewer resources. Sustainability cannot be applied if “fairness” has not been met. This means to strive for a hypothetical situation in which at least the most basic human needs are fulfilled globally. Nilsson chose Olaf Ivarsson as the head of purchasing and head of environment. But he did more: he promoted this position to an executive level. Ivarsson was a great upstream thinker and tough negotiator. The four System Conditions had to be translated into the hotel’s reality and common language. Ivarsson knew that the only way this process could succeed was by integrating every environmental aspect into the hotel operations. So every single hotel had to develop their action plan toward sustainability. Scandic corporative offices would co-lead and coordinate with the rest of the hotels. The key success of this environmental program was to provide a base knowledge for the whole organization through several educational seminars and courses, so they could build a common framework or share a common mental model, from which everyone could make their own decisions. Ivarsson led many co-innovative actions with suppliers, such as working with the laundry supplier to remove chlorine bleach from its laundry processes. Scandic also worked with the dishwashing liquid supplier to reduce detergent dosage in washing machines for breakfast dishes -the amount of detergent needed for breakfast dishes is not as high as for lunch or dinner. In 1995 Scandic was the first hotel chain to design the eco-room. This means that rooms would be designed and built for their eventual disassembly and that they would utilize ecologically benign components. With the goal of returning rooms to nature they created the 97 percent recyclable room (designed together with customers, architects and furniture equipment manufacturers). The life span for eco-rooms is longer than conventional rooms. Luxury, quality and sustainability can work together. The aesthetics of a hotel room can live in harmony with sustainability. All the interiors of the rooms were designed with environmental concerns in mind: reducing 30% of mercury used in mirrors by reducing their size, using wood for floors and parts of the wall, using cotton and wool instead of synthetic textiles, avoiding plastics…Even plastic and metal lamp parts were replaced with wood, etc. Ivarsson also worked with suppliers to reduce the size of bar soap, once they realized that a typical guest used only about three grams of bar soap per stay, while throwing away the rest (the typical bar of soap weighed 15 grams). He also worked with suppliers to reduce waste of the 30ml shampoo bottles by getting the shampoo manufacturer to work together with the bottling company to create a new product. “A small plastic bottle of shampoo per guest per hotel for the past 12 years means millions of bottles,” said Ivarsson. So they developed a more natural soap and shampoo in a PET dispenser. Scandic and other sustainable companies know that, to be successful on the path to sustainability, they have to empower their employees. Empowerment means recognizing and injecting into the organization the power that people have with a wealth of useful knowledge and internal motivation. The principles of empowerment assume that employees are willing to accept responsibilities and improve their daily work processes and relationships. The outcome is a learning organization that continuously innovates, taking advantage of its full human resource potential. The contrary is a command and control approach, exclusively oriented toward following orders from the top, which normally translates into a waste of people and their knowledge. An effective sustainable approach such as that used at Scandic is based on giving more accountability and responsibility to its managers and rank-and-file employees, then hoping for more actions and results. Creativity is also key, and it wouldn´t happen without these empowerment principles. Creativity is sustained by principles such as eagerness to do the job, intrinsic motivation, to be able to think outside the box, not being afraid of being punished if failing to put ideas into practice, etc. Sustainability training programs at Scandic were key to creating this very powerful vision. Everybody was committed and convinced that this new sustainable path was possible. Peter Senge was the first to develop the concept of “shared vision” in his book The Fifth Discipline. He said that a shared vision is not another management concept but a powerful force if it touches the hearts of the people. It generates a sense of connectedness and a shared passion by all business activities. So this shared vision hooked everyone into common goals and objectives. But how did this empowerment manifest itself in Scandic’s employees? From its very beginning The Natural Step Dialogue and Educational Program gathered 1,500 useful suggestions, which were classified as (1) short-term, concrete activities that can be carried out immediately – actions that required no investment such as best practices- (2) ideas that needed further investigation, and (3) ideas that needed investment consideration. Olaf Ivarsson developed a very simple but powerful indicator that worked very well: the number of activities that were specified in the local environmental plans (in which everyone in every hotel were involved) and the number that were actually achieved after six and 12 months. Ivarsson believed that an important way to keep employee interest and engagement alive was to go beyond the basic training level and to generate new and more challenging programs about every two years. So he developed the “Resource Hunt” program to promote very high levels of participation in hotels. In 1996 Scandic started to follow energy and water consumption and the amount of unsorted waste. The key aspect of this program was to create a reporting system SIR (Sustainability Indicator System) every month to measure progress. With this program they were able to reduce 17% of energy, 36% of unsorted waste and 14% of water overall. Average energy consumption at Scandic’s Nordic hotels was then reduced to 47kWh per guest per night, and water consumption to 235 liters per guest. It is estimated that a typical hotel annually releases between 160 and 200 kg of CO2 per m2 of room floor area. Average energy consumption is 55 kWh per guest per night. Water consumption depends on the type of facility and services (outdoor and indoor pool, air conditioning, whether the hotel is located in a tropical area, etc.). However, a standard European hotel could consume between the ranges of 170 to 360 liters per guest per night. Regarding waste, the average for a normal hotel is 1kg to 1.5kg waste per guest per night. Scandic’s hotels figures for 2012 were: (i) unsorted waste: 0.5 kg per guest per night (ii) energy consumption: 45.9 kWh per guest per night (iii) water consumption: 201.9 liters per guest per night (4) fossil carbon dioxide: 1.9 kg per guest per night. Having employees that are empowered toward sustainability practices also means providing the needed resources and being able to measure environmental impacts and advancements. In this way, Scandic developed different tools and systems, which allowed hotels to compare their results. Brian Nattrass and Mary Altomare stated in their book The Natural Step for Business that hotels were publishing their figures against other hotels, and country against country. Such empowered outcomes could be seen in a healthy and friendly competition among hotels with respect to meeting environmental goals; through achieving environmental indicators and through being recognized individually and collectively for the tangible contribution to protecting the environment. Scandic had the goal to involve every person in its organization: all 5,000 employees! Thousands of different activities have taken place in the Nordic Countries. All these activities have one thing in common: they are based on personal involvement rather than fundraising. Activities which involved personnel working hours such as offering and serving lunch to the homeless, donating bed linen to shelters, cooperation with schools and universities, etc. The “Scandic in Society” program aims to contribute to the well- being of societies in which the company operates. Following the dialogue with team members, community programs were created in each hotel. Individual hotels frequently enter into partnerships with local authorities and Non-Governmental Organizations (NGOs) to find innovative solutions for local community problems. In 2005 Scandic also supported the breast cancer campaign of the Swedish Cancer Fund by providing 3 million Swedish crowns. In October of the same year, Scandic’s guests could book a room at a “pink price” with 10 per cent of income going to the Pink Ribbons campaign. Since 2006 every cup of ordinary coffee, espresso and cappuccino served at the Swedish Scandic hotels is fair trade coffee. This means 9 million cups every year. Fair trade is an initiative designed to help especially small-scale farmers to survive in the global economy. Products labeled with fair trade guarantee strict standards worldwide on certain environmental, labor and remuneration practices. Fair trade means that a minimum price is paid for coffee, which gives more than 20 per cent extra income to the growers for their certified coffee. With that extra money they can provide for their communities through different activities, such as the construction of schools. Organic products not only benefit the environment by reducing environmental impacts, resulting in less transportation required (food miles), less soil erosion, no pesticides and herbicides… but they are also good for the community, as buying locally supports local farmers. Since 2002 all Swedish hotels offer breakfast with KRAV 22 eco labeled items. The Swedish KRAV organic label stands for sound and natural environment, solid care for animals, good health and social responsibility. In 2004 Scandic introduced the disability coordinator in the person of Magnus Berglund, who first entered the company as a cook but later had to abandon his job due to a joint muscle disorder. Magnus has been Scandic’s Accessibility Ambassador ever since, working to ensure that all hotels are accessible to everyone. Scandic’s unique accessibility standard contains 110 points, 81 of which are compulsory for all hotels, and the whole list is met in both new and renovated hotels. In 2006 Scandic received the St. Julian prize for its contribution to increasing accessibility. The UN has also recognized Scandic’s focus on accommodation for guests with disabilities. B. Nattrass and M. Altomare write in The Natural Step for Business that if omtanke could be translated into English, it would be analogous to “profound positive caring and attention”. Nilsson described omtanke as an essential core learning process in Scandic, “a way of maintaining the values in the company in a very solid way”. Omtanke could be seen as the glue which holds everything and everyone together by being open and honest to each other and the rest of stakeholders, by taking care of the shareholders, by maintaining the highest integrity when working with fellow employees and by taking care of society. It was Robert F. Kennedy who stated a long time ago, “Few will have the greatness to bend history itself, but each of us can work to change a small portion of events. It is from numberless diverse acts of courage and belief that human history is shaped. Each time a man stands up for an ideal, or acts to improve the lot of others, or strikes out against injustice, he sends forth a tiny ripple of hope, and crossing each other from a million different centers of energy and daring those ripples build a current which can sweep down the mightiest walls of oppression and resistance“. Numberless diverse acts of courage and belief in which history is also shaped happen when role models such as Scandic inspire others towards sustainable practices. Together with many great sustainable companies, they generate different centers of energy in which sustainability is progressively uplifting others in society.Scandic Hotels share a vision of “Omtanke“, caring for their guests and each other while caring for the environment and society. They have to be profitable by bearing a good spirit of enterprise and by doing things efficiently. Without profits no company can be sustainable. But at the same time, they know that the environment matters, so by being a role model Scandic thinks they can encourage others to do so. The same applies for being a socially responsible company, taking a share of responsibility with the local and global community through the Scandic Society Program. We definitely need role models like Scandic for the success of a sustainable society in the near future. Scandic is a modern hotel chain where conscious people come for inspiration and renewed energy. With about 150 hotels and 30,000 rooms, they are already one of the largest hotel operators in Europe. And they are continuing to grow — within a few years, there will be over 200 Scandic to choose from.